Kris: I’ve said it many times before, I love cooking with native Australian ingredients. Roasted wattle seed is an amazing product to use in desserts. It is the roasted seed of the Acacia victoriae, which grows in Central Australia. It has amazing coffee, chocolate and hazelnut characteristics. You can buy it pre-gound or as whole seeds. If you buy whole seeds just crush them using a mortar and pestle. It is available at a lot of speciality spice stores or on-line. 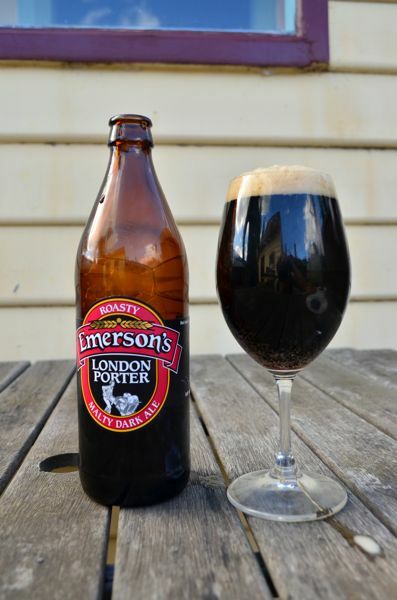 Kris: I matched the dessert with Emerson’s London Porter. It is a 4.9% Porter from one of New Zealand’s great craft breweries. 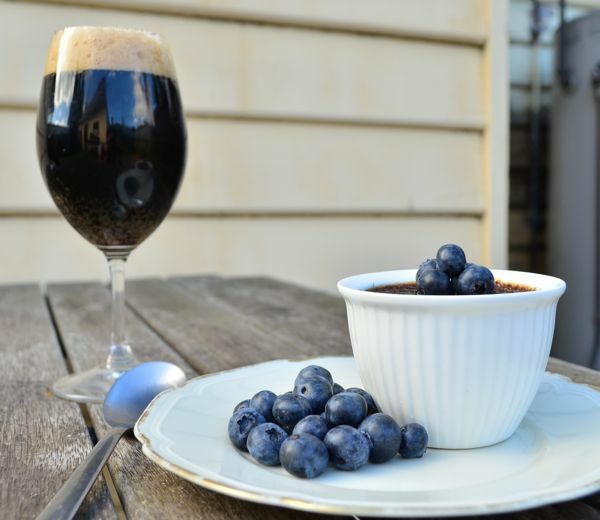 The roasty chocolate and coffee notes in the beer complimented the flavours of the wattle seed in the Creme Brulee. Caroline: Delicious. 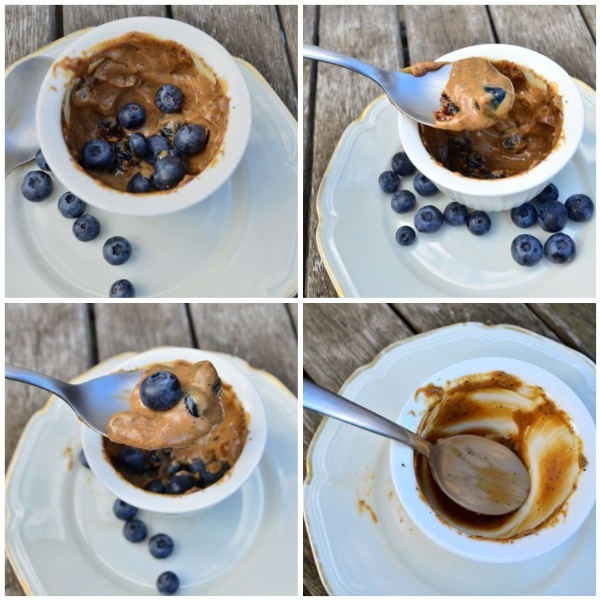 It tastes so good with about a whole punnet of blueberries thrown into the mix as well! 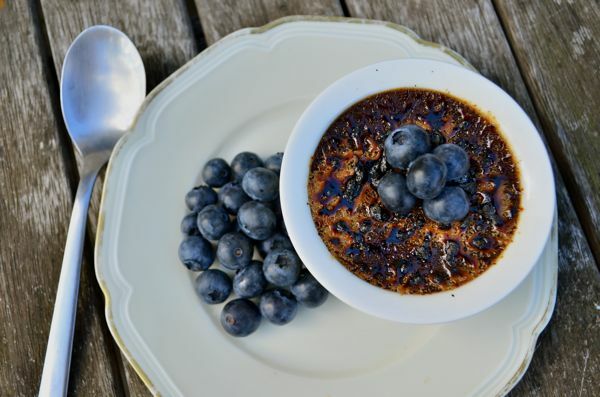 I love a good brulee, the crunchy sugar top and the creamy insides, yum. The wattle seed had a coffee bitter-cocoa-hazelnut character, and how can you go wrong with that? I thought the beer was a good match, but since I DO have a sweet tooth (unlike Kris) I thought it might be better with something richer and sweeter like the Hitachino Milk Stout or a Chocolate Stout. But hey, that’s just me. Kris: Any excuse for a stout hey Caroline? Kris: I have been cooking for guests a lot lately (not that I’m complaining, I love it). 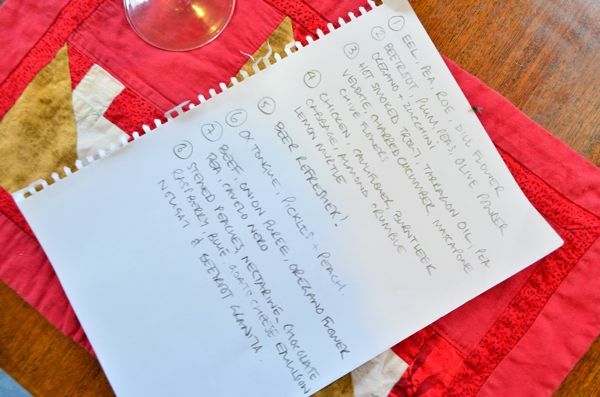 It was a treat to be invited to an 8 course dinner, hosted by Luke and cooked by his friend, Simon. 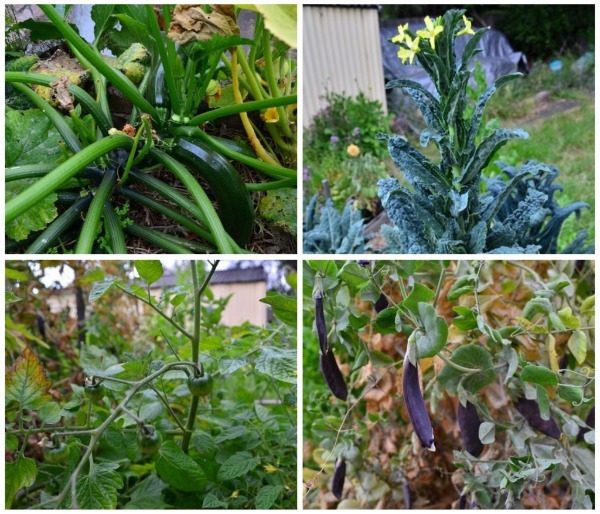 It was Simon’s first visit to Tasmania, so he was inspired to use some local produce as well as what is growing in Luke’s garden. His style of cooking is close to my heart; Local, fresh and in the company of good friends. 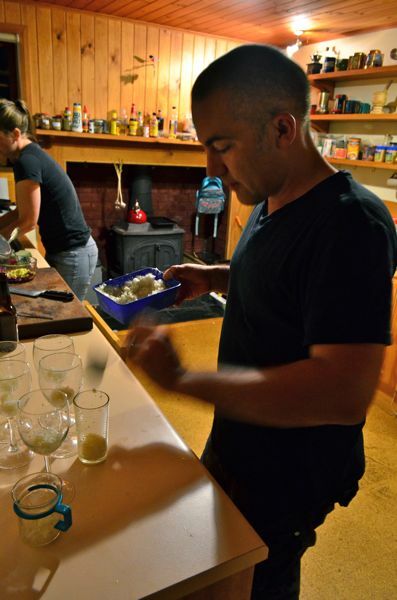 He is a great cook and is our first honorary Ambersandwich guest chef. 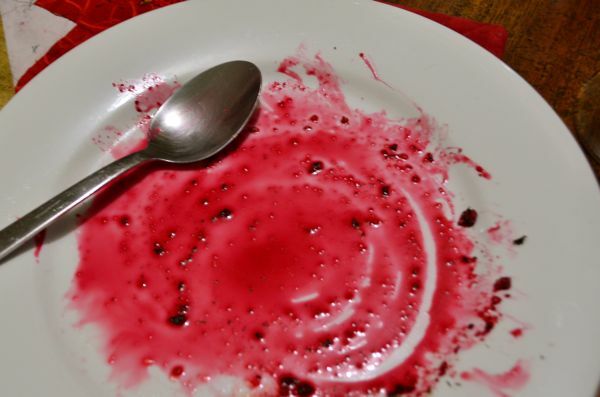 I haven’t included all of his dishes, but below is more than enough to whet your appetite. 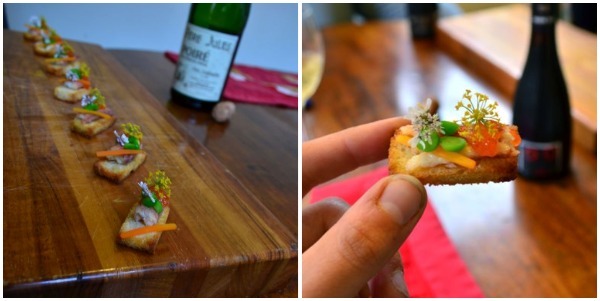 First Course was smoked eel, served on a crouton with pea, salmon roe and dill flower. I chose the Le Pere Jules Poire to match with the dish. It has an aroma of sweet, ripe pears and has a zippy lemony finish. It was an ideal match, the pear is a classic match with eel and the acidity cut through the oiliness of the fish. Caroline: The Le Pere Jules is a pear cider, a bit sweet with a lemony finish and very delicious. 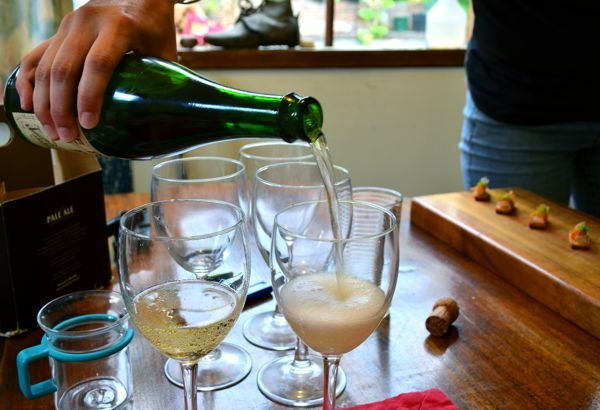 It was a great match for our ‘amuse bouche’ which was so delicate, it was nice that the cider didn’t overpower it. Kris: Next up was Beetroot, Plum, peas, olive powder, oregano and zucchini flower. 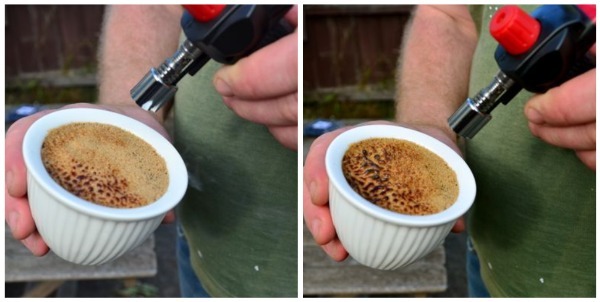 I thought the Belgian classic Saison Dupont would be a great accompaniment to this recipe. 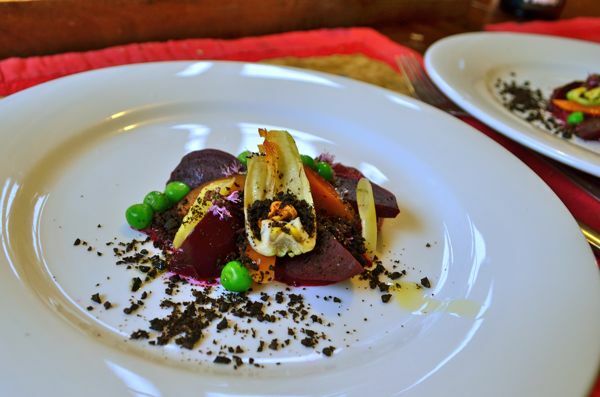 It’s earthiness and subtle sweetness complimented the beetroot, peas and the olive powder. The tartness of the beer added a bit of zing to the dish. Caroline: Beetroot is something that isn’t eaten very much in the States, but it has quickly become one of my favorite vegetables! It just tastes so fresh and earthy! The ‘olive dust’ was also a great earthy component. One of our friends at dinner detested olives until she tasted these! That’s how good it was! 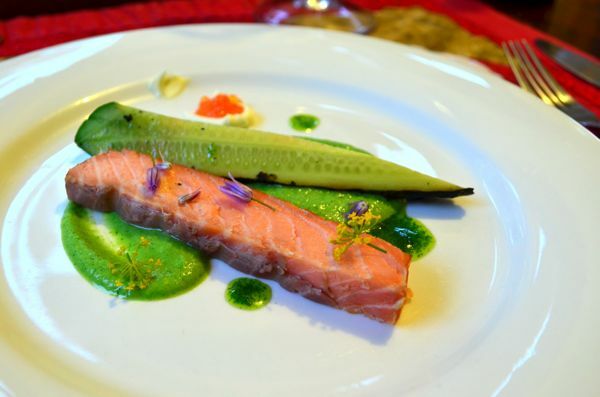 Above – Hot smoked ocean trout, tarragon oil, pea veloute, charred cucumber, marscapone and chive flowers. We decided beer or wine would over power the dish, so we enjoyed it as is. 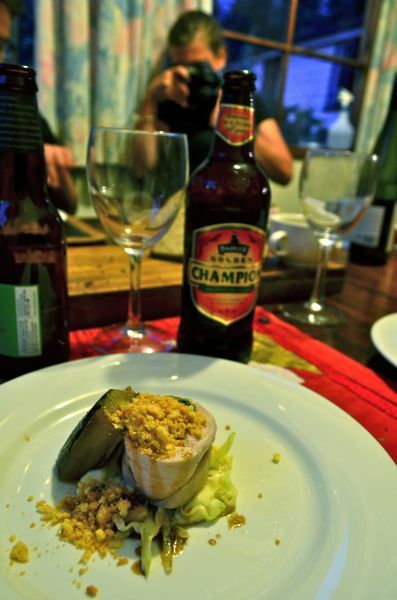 The next dish we decided to match with beer was Chicken, Cauliflower puree, burnt leek, cabbage, almond crumble and lemon myrtle. My pick of beers to match was the Badger Golden Champion (brewed by Hall and Woodhouse) from the United Kingdom. It is an English style Summer Ale brewed with elderflowers. 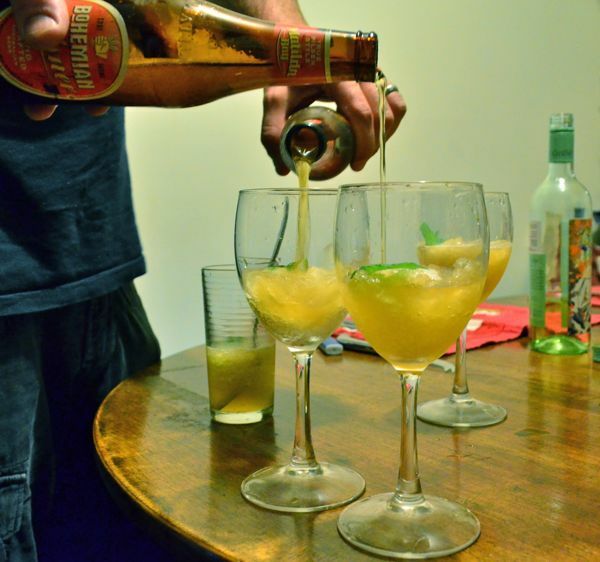 It is slightly sweet, nutty and very floral. It was a match made in heaven, and an awesome summer beer; definitely a highlight for me. A lager and lemon granita was a fantastic palate cleanser in between dishes. We added some fresh mint leaves from the back garden to the granita and topped it up in the glass with some Monteiths Bohemian Pilsner. Caroline: Granita is a fancy term for snow cone. Delicious, beer snow cone. 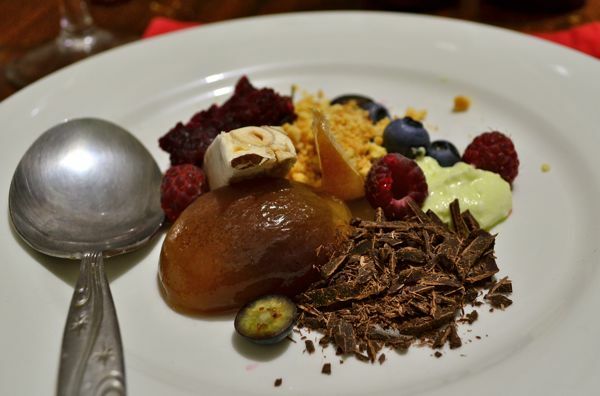 Kris: Stewed peaches, nectarine, chocolate, blueberries, blue goats cheese emulsion, nougat and beetroot granita was a perfect end to a long and thoroughly enjoyable night of eating and drinking. Thanks again to Simon for putting together such an amazing menu. Caroline: There’s nothing better then a long dinner shared with friends! After 8 courses, a couple bottles of wine and beer, and 5 hours of fun we were all ready to be rolled home and fall into a food coma! Thanks again for dinner Simon and Luke!